The Maguire WSB Blenders are the most popular blenders worldwide. With nine blender series and over 120 models to choose from, throughputs range from 45 kg/hr (100 lb/hr) with the world’s smallest gravimetric blender, the MicroBlender™, right up to the MaxiBatch™ series which reaches throughputs up to 5,500 kg/hr (12,000 lb/hr). 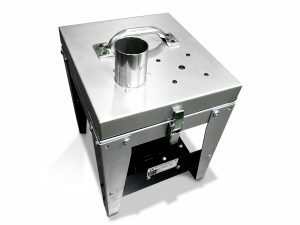 There are options to add on a range of feeders for pellets, powders and liquid color, for standard and specialist solutions for molding, extrusion and compounding applications. High consistent accuracy – On every material within ± 0.1% on a 1% setting. Return on Investment – Typical Return on Investment within 6-9 months of installation. Regrind control – The WSB Blender automatically adjusts regrind usage to maximize on regrind consumption, while dosing the minimum required for natural and color. Color and additive control – Save typically 30% on Masterbatch and additive usage compared to volumetric dosing. Data – While raw materials can account for up to 70% of plastics processors costs, our blenders measure right down to a 10th of a gram for every material dispensed. This reduces operating costs, improves efficiency and increases profitability. Automatic error correction – Every gram of material automatically adjusted towards perfect dispense rates. Vibration management – Load cell readings that have been compromised by machine shock or vibration are detected and discarded. 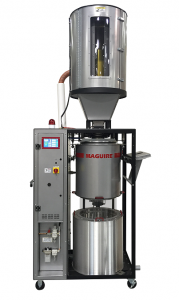 Maguire vacuum drying systems offer processors unique benefits in terms of speed, material quality and savings, all of which are backed up by the Maguire 5-year warranty program and operated by a simple to use controller. 6 times faster – Dries resin 6 times faster than desiccant dryers. Wide vacuum dryer range – From 4.5 kg (10 lbs) up to 455 kg (1,000 lbs) per hour. 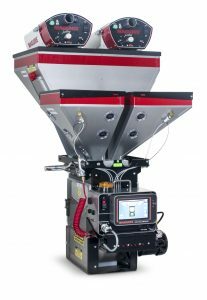 Modular system – Allows for increased throughput with larger heating hopper. Adaptive drying – This clever technology prevents material from over drying and uses 60% less energy. Quicker material changes – Load cell control ensures no material is left in the dryer when production stops – start the next production run immediately. No material cross contamination – No material is left in the system once the dryer is programmed to stop. Maguire has a broad range of materials conveying solutions for small, medium and large processors to meet your individual requirements. Maguire’s three phase QUAD range supports a variety of material receiver sizes from 2 – 100 liter capacities and a range of QUAD vacuum pump sizes using a single or twin stage pump to load a maximum of 4 receivers. For mid-sized applications, the Maguire MLS Loading system provides all the benefits of a mini-central system with the added convenience of being compact. For more complicated material pipework layouts and large conveying systems, Maguire’s FlexBus Central System solution provides three phase materials conveying. QUAD – Great as a standalone option for both small and very large applications for up to 4 receivers per pump. MLS Loading System – Compact, easy to reposition and low maintenance. Suited to mid-sized applications. FlexBus Central Conveying – Operate up to 5 vacuum pumps and 240 receivers using a single central FlexBus control. The system can adjust to different material bulk densities and throughputs and comes with line cleaning incorporated into the system. Central System Control – Our controls are intuitive, icon driven and easy to operate via a touchscreen. We’ve literally turned loading on its side with the Maguire LoPro™, a vacuum loading unit that’s up to 80% lower than traditional upright receivers. These self-controlling receivers are easy to configure for automated mini-central conveying to multiple blenders. Low profile – At up to 80% lower than traditional receivers, the LoPro easily fits into your existing production setup. The system controls itself – No separate controls or complicated set up and settings. Receivers load on a first-in, first-out basis. Simplified maintenance – All operating components are housed in a removeable module that allows for quick cleaning and maintenance. 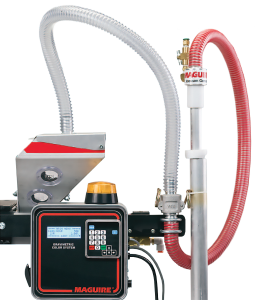 Easy configuration – The user-friendly set-time button allows for precise fill times to be applied. Brushless motor – Vacuum is supplied from a mini-central unit which has a brushless motor for minimal maintenance. Ideal for poor-flowing, low density flake – The system has a release flap that is up to 4 times wider than the flap on a traditional upright receiver. Filter cleaning – Filter cleaning occurs at the end of every cycle for less cleaning and maintenance intervention. 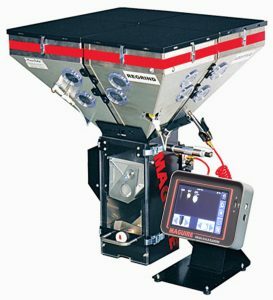 The Maguire MGF Gravimetric Feeder precisely measures the amount of additive that is fed directly into the machine throat to eliminate costly waste. 2 load cells ensure dosing accuracy within ± 0.2% of your target let-down ratio. Advanced accuracy – 2 load cells better than 1. Higher resolution – Only material and hopper weighed, not the complete feeder. Choice of screw sizes – For molding and extrusion applications. No downtime associated with color change – Spare hoppers available for faster color changes. Self-priming control – Set and run. Clear ROI – vs. comparable and volumetric systems. Precision – Consistent stepper motor control. Intuitive setup & Control – Fast and simple. The belief in the technology and our competence allows us to offer customers an unprecedented 5 year warranty on all our major equipment. To know more details about product offerings, technical details and other information about Maguire, please visit http://www.maguire.com.